In order to understand the impacts of trauma on the brain we first need to understand how a normal brain develops. Integration is the key to well-being and occurs vertically and laterally within the brain. The brain develops through the creation of neural pathways which connect different regions of the brain together. A. 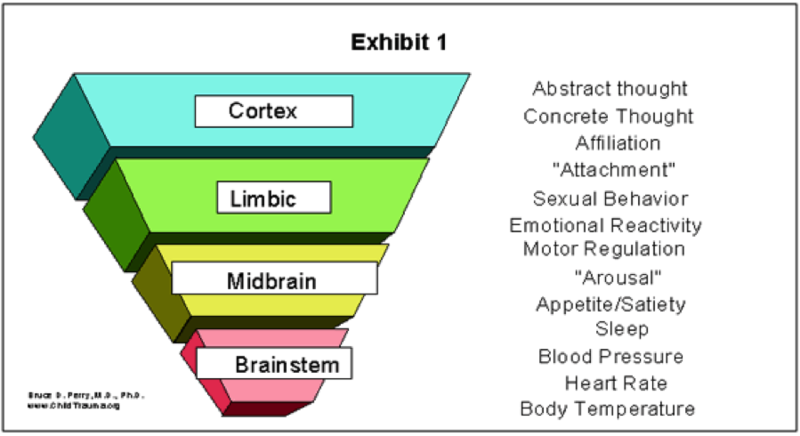 The brain develops sequentially from the bottom up. The first structures of the brain to develop form the foundation for the next structures to grow. The brain continues to develop with each successive part responsible for more complex functions (e.g. starts with movement, then feeling, then identifying emotions, then ability for abstract thought and self-control). The order is outlined below, explaining the development and role of each structure. The largest part of the brain which includes the frontal lobe, parietal lobe, occipital lobe, and temporal lobe. The right and left hemispheres of the brain are each responsible for different functions and develop at different speeds. The hemispheres develop at different times and speeds over the years. The right hemisphere is developing at a greater speed to two years of age. After two, the left hemisphere takes over. This intensity of development then oscillates between the two every two years until about 8 years old when they start to integrate with each other. Watch this video for detailed information on the brain structure. Neuronal connections are strengthened best when an individual repeats an experience over and over. If the experience is not repeated, the connection will disappear. To master a motor activity for example, a child is required to repeat and repeat a running motion and in the practice of it, becomes more precise and faster. Similarly when playing a musical instrument, learning timetables, singing a song, reading or dancing. These neural pathways in the brain enable each individual to efficiently interpret the world, their reactions to it and prompt relevant responses. The brain establishes these pathways as templates to be able to quickly compare a new situation with memories previously stored and ultimately interpret the next steps or actions that will be taken. Integration of neuronal networks shapes the thoughts, feelings and actions of children and young people. The greater the number of pathways, the more the functions of the brain become integrated. Greater integration results in children being more adaptive and flexible. When integration is blocked or put under pressure by stress and trauma, the children’s inner world and capacities to adapt to the needs and challenges of their physical and relational environment is significantly hampered. Rather than supporting learning, connection and other developmental goals, the child’s neuronal connections have formed to support survival in a stressful caregiving environment. Experiences of trauma can also mean that hemispheric activation is kept separate and there is reduced opportunity for hemispheric integration. In this case the "RH is seeing the whole collage but is trapped in the present (feels like the trauma is still happening) while the LH is unable to pick out details and put meaning to what is happening” (Australian Childhood Foundation). As such, the goal of any support plan for children and young people is to promote integration at a neurobiological and interpersonal level.